2019 - 04 - No Foolin' - FABRIC IS HERE! Lots of things are happening as springtime melts the snow and new flowers begin to bud. 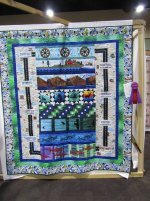 - Tri-Cities Quilt Show "Quilts Out West" RESULTS: Theme Category- Honorable Mention for my "Road Trip - A Columbia River Story Quilt"
Fly Free was juried into the MQX-New Hampshire show and will be on display next week. If you're at the event, hope you'll look for it and send me a photo! - Show & Share - Monday April 8, 412 Federal Ave, Grand Coulee --come at 9am and bring your latest finish or WIP. Stay and sew if you'd like until ~ 4pm. 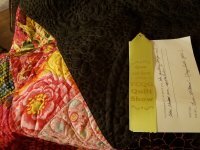 - Class ---Jelly Roll Rug or Placemat -- A second class will be hosted in the evening. Let me know if you are interested. It will have pre-work, a short first session with homework; and a longer 2nd session to finish. The date has not yet been set, so let me know if you're interested. 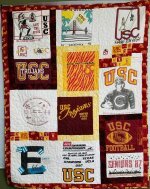 - T-shirt quilt class - This is a design and technique discussion class. Tuesday 1pm - April 16. Let me know if you're interested in participating. - New Products have arrived! Check out these beautiful Woolie Flannels at a special price of $7.99/yd. Shop Calendar --is up to date - Check it out here. 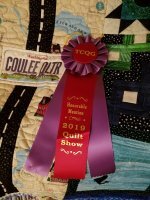 Still best to make an appointment if you would like to drop off a quilt or pick up resources to make your next quilt or sewing project. Thank you for considering options locally...I can't stock everything but have made an effort to have available commonly needed fabrics, notions, tools and have new inspiration with a variety of books and patterns. I am happy to order on your behalf when possible and will help you find something regionally if that makes the best sense. PREVIEW - A Poinsettia Winter - from In The Beginning Fabrics - limited quantity BOM kits will be available starting May 2019. Let me know if you'd like to reserve one. 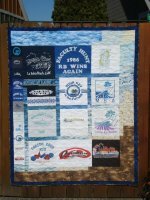 JELLY ROLL RUG/PLACEMAT - We had a great start at our day-time class and have now added a second class that will be held during a couple of evenings. If this timeframe works better for you, please let me know. Date TBD. Class fee $20 - includes detailed design instruction and option to have your t-shirts stabilized by me (courtesy of our local SunflowerGraphics' Heat Press). So-Sheer supplies for stabilizing are available in the shop. 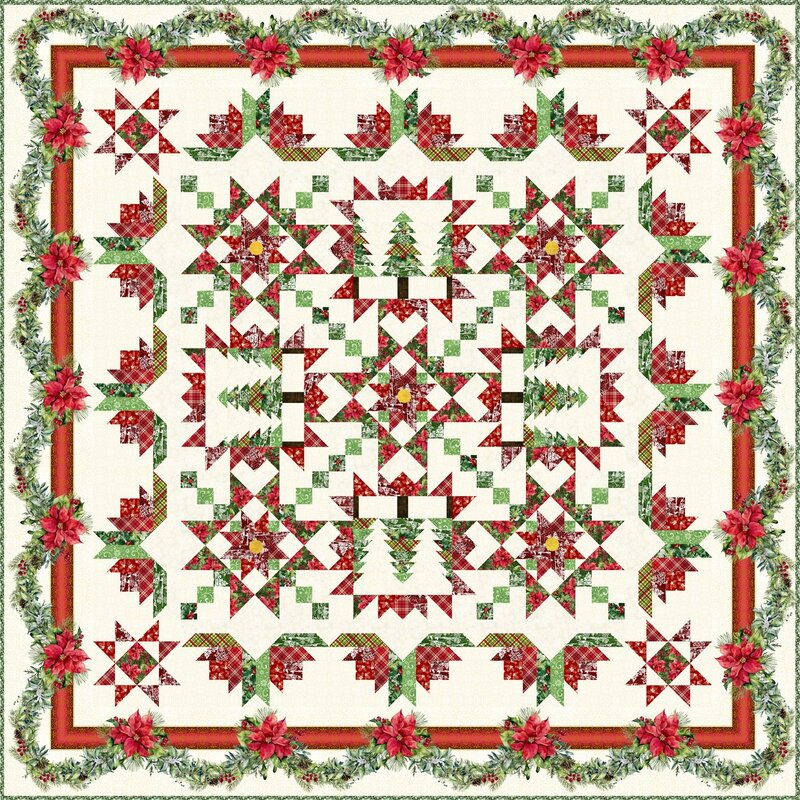 OTHER CLASS OPTIONS TO CONSIDER FOR 2019 -- seasonal table runner; bag; patterns from Barbara Persing, Elizabeth Hartman, Violet Craft (english paper piecing--all by hand or foundation paper piecing), Sew Kind of Wonderful (new book with lots of seasonal wallhangings and curved ruler), Turning Twenty and Strip Therapy. Many options to choose in the shop from these last 6 designers. Make an appointment to come check them out and help me plan a schedule for classes. Check the 'patterns' category on the website for just some of the possibilities --come in for the rest! If there are any particular techniques or projects that you'd like to have as a class, gather your friends who are interested and we'll schedule a class for this winter/spring that works for you. Costs will be determined based on number of students and time needed for the project. Aurifil has extended a great deal and I'm offering it right here in Grand Coulee. $14.99 gets you a spool of white thread and a box to put it in--your own brand new box! Typically here in Grand Coulee, I offer the spools at $13.35/spool and if you buy a whole case (12 spools) at one time, you get the case for $125. This offer will let you buy them at one or more a month until you reach 10, then you'll get the last 2 (to make 12) free. You can do this as often as you'd like, but is available only to the first 30 customers. We'll track your spool purchases that qualify for the thread club discount. Free shipping for orders of $75 or more. Thank you for your patronage.